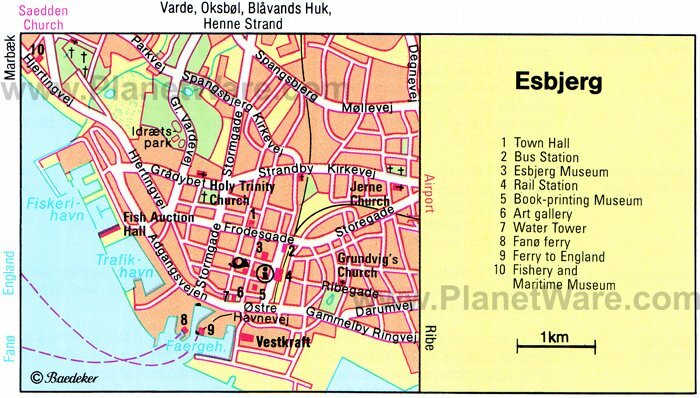 Esbjerg, the fifth largest town in Denmark, presides over the west coast of Jutland, the country's mainland peninsula, opposite the northern tip of Fanø Island. It's Denmark's most important North Sea harbor and largest fishing port in addition to being the base for Denmark's significant oil and gas exploration in the North Sea. The huge sculpture Man Meets The Sea proudly marks the fact that this is Denmark's trading gateway to the west. Although Esbjerg is primarily an industrial port, there are plenty of attractions in the city and surroundings to make a visit worthwhile. Take time to explore some unique architecture, impressive museums, and excellent coastal amenities. A short 12-minute ferry ride from Esbjerg is the extremely popular island of Fano (Fanø), a must-see attraction if visiting the area. It's around 16 kilometers long and five kilometers wide and an excellent place for a day trip. This unspoilt, tranquil island has long been a magnet for tourists and Danes alike who flock here for magnificent beaches, cycling paths, nature walks, and many terrific places to eat. For history enthusiasts, Fano also has a number of bunkers from World War II. The island is famous for its remarkable tidal fluctuation. When the tide is out, you can quite literally walk for several kilometers from the shoreline before reaching the water. This, the newest and largest national park in Denmark, stretches over four communes and incorporates pristine beaches, wetlands, and nature reserves. Lying in the center of Eastern Atlantic migratory routes, the Wadden Sea is one of the most important tidal areas in the world. More than ten million migratory birds use the coastline as a stopover each year. In addition to the abundant birdlife, the extensive shoreline hosts Denmark's largest population of spotted seals. Summer is the best time to see these gentle creatures; hop aboard a Seal and Wadden Sea Safari. Cruises depart from Esbjerg Harbour daily. A southerly 30-minute drive from Esbjerg (Routes 24 & 11) is the Ribe Viking Center, a must see for all fans of ancient Nordic times and Viking history. Ribe has long boasted strong Viking links, and as a consequence, the center was established in 1992 to celebrate the fact and let visitors experience a true taste of life in the Viking Age. Here, you'll find authentic reconstructions of Viking settlements complete with marketplaces, farmhouses, and homes. Highlights include the International Viking Market, but visitors also flock here from across the world for archery, coin minting, falconry, and a range of hands-on activities. All in all, this is a great day out. Esbjerg's unmistakable landmark, the nine-meter-high sculpture Man Meets the Sea, imposingly overlooks both the Wadden and North Seas. If arriving by boat, you really can't miss it. The sculpture was designed by Svend Wiig Hansen and unveiled in 1995 to celebrate Esbjerg's 100th anniversary as an independent municipality. Designed to portray man meeting with nature, it has something of a mystical aura reminiscent of Ancient Egypt's sphinxes. In clear weather, the sculpture can be seen from as far away as ten kilometers. Opposite the Fisheries and Maritime Museum, Man Meets the Sea is one of Esbjerg's prime tourist attractions and famous throughout Denmark and beyond. In Esbjerg Municipal Park, near the extensive harbor, you'll find the Water Tower (1897), one of the town's landmark structures. Close by, at Havnegade 20, is the Art Gallery (Kunstmuseum), housing a comprehensive collection of 20th-century Danish paintings and sculpture. Among the renowned exhibits are works by Harald Giersing, Wilhelm Lundstrom, Richard Mortensen, the Jorgen brothers, and Arne Haugen Sorensen. Special exhibitions and concerts of international repute are regularly held here, too. In the entrance is the ironwork sculpture 'Esbjerg' by Robert Jacobsen (1962). This experimental museum is both a creative space for established artists and a platform for the young art scene. Around ten-minutes' walk from the Water Tower on Torvegade, this worthwhile museum details Esbjerg's history and hosts a fascinating amber exhibition. Amber, known as 'Danish Gold,' has long fascinated humankind, and the west coast of Jutland is famous for large discoveries of the precious fossilized resin. Several hundreds of unique amber objects spanning 10,000 years of history are beautifully presented in this impressive collection. Here, you'll also discover the story of Esbjerg through the antiquity and city exhibitions with various recreated scenes from both the Iron and Viking Age. Marbæk Nature Reserve, 12 kilometers northwest of Esbjerg, covers 1,300 hectares and borders Ho Bay and Varde Stream. The varied countryside is excellent for a range of outdoor activities including hiking, cycling, and horse riding. You'll also find some wonderful beaches with pristine sand dunes. The lakes have a profusion of unique bird life. At Marbækgård Farm, you'll find the district's Tourist Information Center, a restaurant, and mini-golf. Close by, the beach area has barbecue facilities and picnic tables. Around a 40 kilometer drive north of Esbjerg (Road 181) brings you to the wonderful white beaches of Henne Strand, famous for glorious sand and long dunes stretching as far as the eye can see. Neighboring Henne is a popular Danish tourist town with all the amenities you'd expect. The area is a firm favorite with both Danish and foreign holidaymakers, and it's not hard to see why. Many activities and attractions are on offer, including an indoor water park, kite-surfing, beach games, restaurants, and a wealth of local arts and crafts to browse. If you're planning to stay here, you'll find plenty of hotels and campsites. The town of Ribe, one of the oldest in Denmark, lies about 30 kilometers from Esbjerg and is a launching point for a fascinating day trip to the little marsh island of Mandø in Wadden Sea National Park. Rich in birdlife, Mandø Island is only accessible at low tide from Vester Vedsted in a bus drawn by a tractor. The trip is an adventure in itself. Once there, you can browse interesting exhibits on nature conservancy and ornithology, as well as a mud-flats exhibition in the Mandø Centre. Terns, sandpipers, waders, and ducks such as eiders breed on the island. From Mandø Island, you can also visit Koresand, a sandbank in the mud flats southwest of the island. The trip lasts about three hours and includes a visit to the seal reserve. While visiting Ribe, stop by and explore the Romanesque Cathedral built with limestone dug from quarries near Mønsted nearly 1,000 years ago. Less than a two-hour drive from Esbjerg, the fertile island of Als nestles between the Jutland Peninsula and the larger island of Funen. Sparkling bays beckon on the island's west coast, and the beautiful beaches here make Als a popular place for vacations. Sønderborg, the capital, straddles the Als Strait (Alssund), which separates the island from the Danish mainland and is traversed by two bridges. Highlights of a visit to the island include Sønderborg Castle, with a museum that unveils the region's history; a pretty harbor with cafés and restaurants; and a sprinkling of old churches and mills. In the north of Als, Nordborg was originally a castle built in the 12th century as defense against the Wends. It was destroyed during the wars against Sweden, and rebuilt between 1665 and 1670. Today, it houses a college of further education. Besides sightseeing, popular activities in Als include fishing, swimming, and sailing. About 90 minutes' drive from Esbjerg, Silkeborg lies on the Langsø ("Long Lake") in an area of Central Jutland cloaked by forests and lakes. These are the "Danish Lake Uplands," through which flows the Gudenå river. During the summer months, colorful fountain-displays illuminate the banks of the Langsø. Other tourist attractions in Silkeborg are the Indelukket, a marina and recreation area; the Museum Jorn displaying the art of Asger Jorn; and the local history exhibits at the Silkeborg Museum. In summer, you can take a trip on the world's oldest paddle-steamer "Hjejlen" through one of the most beautiful parts of Denmark to the 147-meter-high Himmelbjerg (Heaven Mountain). The top of the hill affords splendid views over the surrounding forests and lakes. About two and a half hours' drive from Esbjerg, Limfjord is a shallow stretch of water with beautiful scenery and calm waters that have inspired many poets and writers over the centuries. The 180-kilometer-long fjord divides Nørrejyske Ø, the island of north Jutland, from the rest of the peninsula and extends from Thyborøn in the west to Hals in the east. The shallows make the passage of ships somewhat difficult, however Limfjord offers ideal conditions for sailing, and many of the region's towns beckon with pretty harbors and ample moorings. The western entrance to the Limfjord from the North Sea is the Thyborøn Canal, which flows into the lagoon known as Nissum Bredning. On the north side of the canal lies the popular holiday area around Agger and Vestervig.